Even if the Ducks didn’t bring a national title back to Eugene we can still look back at their bowl season and appreciate their accomplishments. Which is exactly what Ted Miller of ESPN.com did in compiling the Pac-12 all-bowl team. Miller gave credit where it was due to the Ducks’ offensive standout performances, giving Oregon players five of the 11 spots. Leading the way was quarterback Marcus Mariota who threw for 671 yards and four touchdowns this bowl season. Thomas Tyner reminded everyone that Royce Freeman is not the team’s only running back by pounding Florida State for 124 yards and two touchdowns. Carrington exploded for 165 yards and two touchdowns against FSU. Receivers Darren Carrington and Byron Marshall took both wide receiver spots on the team. Carrington, despite missing the National Championship game, played lights out against FSU, hauling in 165 yards and two touchdowns. Marshall had the most exciting play of the night for Ducks fans against Ohio State with his 70 yard touchdown reception, he finished the night with 169 yards and a score. Rounding out the offensive leaders for Oregon was Jake Fisher, an anchor on the offensive line that was sorely missed earlier this season against Arizona. Replacing Fisher, an experienced leader for the offensive line, will be a tough task for head coach Mark Helfrich this off season, if Tyler Johnstone’s rehab doesn’t go as planned. 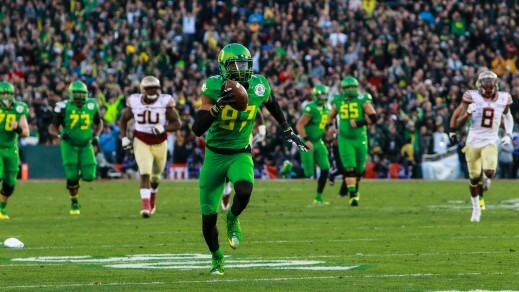 Defensively some of Oregon’s veterans received their due spot in the limelight. Linebacker Tony Washington had a great Rose Bowl with four tackles, a sack, and a forced fumble that he returned 58 yards for a touchdown. Troy Hill stepped up as a leader for the secondary when Ifo Ekpre-Olomu went down and it was noticed by all, especially after leading the Ducks with nine tackles against FSU. While this list may be littered with players that will not be returning next season, it’s important to remember that the younger players have had a chance to learn from them all season. Surrounding yourself with talent will only make you better, competing in the Pac-12 will make you the best. ESPN has notoriously favored the SEC for many years, but after the fierce competition in the west this season even they admit that the Pac-12 was the No. 1 conference in 2014.